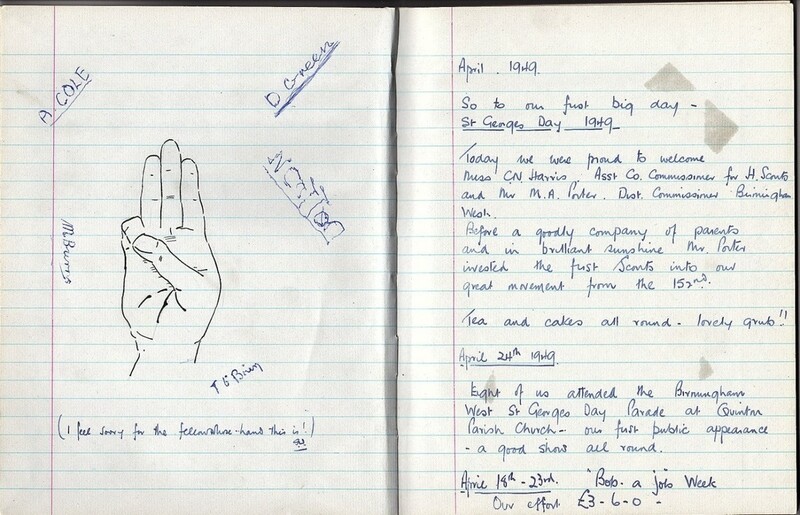 During 1949 the boys of the 152nd experienced their introduction to scouting. 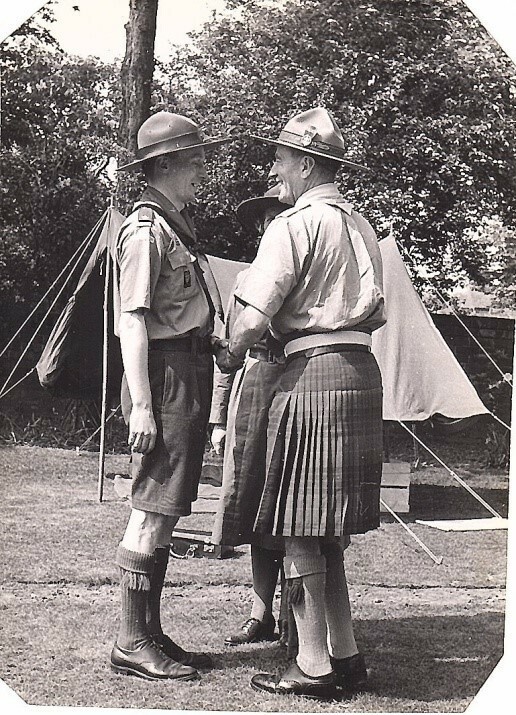 My grandfather had been a Scout for many years and my grandmother worked with the Scouts as a supervisor for much of the 1930's. 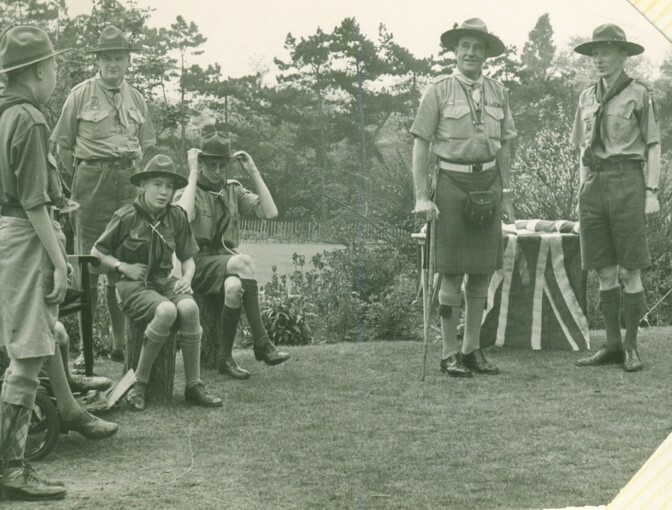 It is clear that others involved at the beginning also had active experience in the Scouts; The trustee Mr Quayle was himself a senior officer and can be seen wearing scout uniform in Cerebral Palsy Midlands' photographic history. The troop started with nine boys, and shortly afterwards was joined by a tenth. They are all named. There were two patrols of five, the Swifts and the Kingfishers. 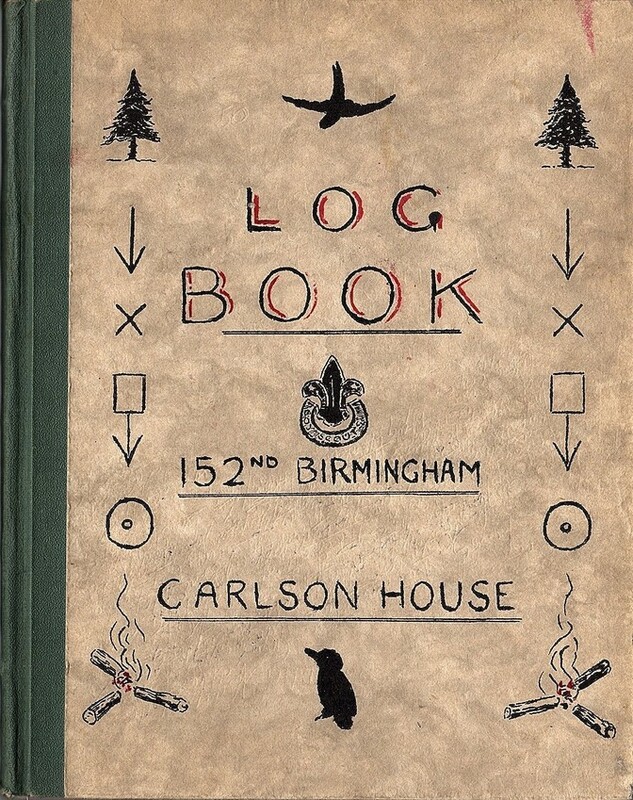 Their emblems appear on the cover of the 'Log Book' drawn by my grandfather along with the Scout Badge, the camp fires and the trees. The boys learned about ropes and signals and first-aid and went to a camp site. They also attended an important event or two. Mr Sutton was helping out with the transport; he was the father of Anthony Sutton, a member of the 152nd and later the first boy from Carlson House School to go to University! Towards the end of April they took part in Bob-a-Job Week raising three pounds and six shillings no less! 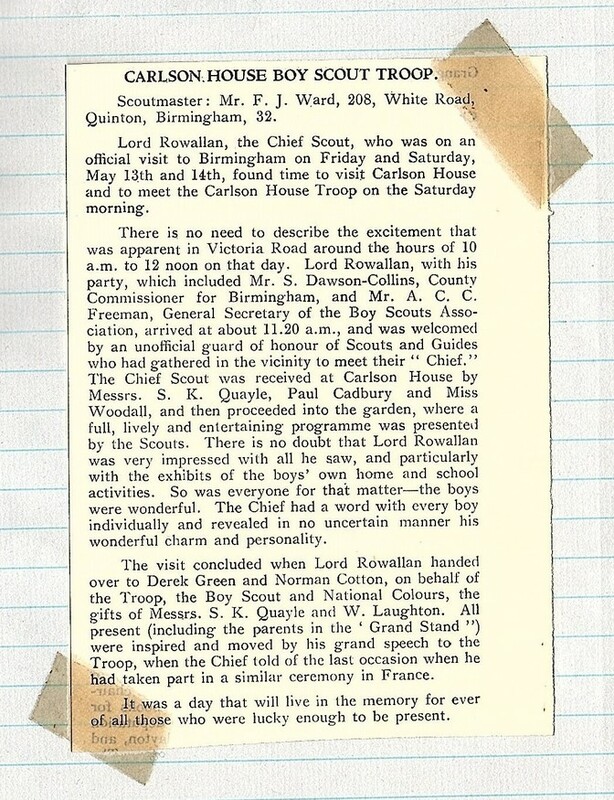 Then, late in April, the boys received the amazing news that the Chief Scout, Lord Rowallan, was going to come and visit them personally and present them with their colours. 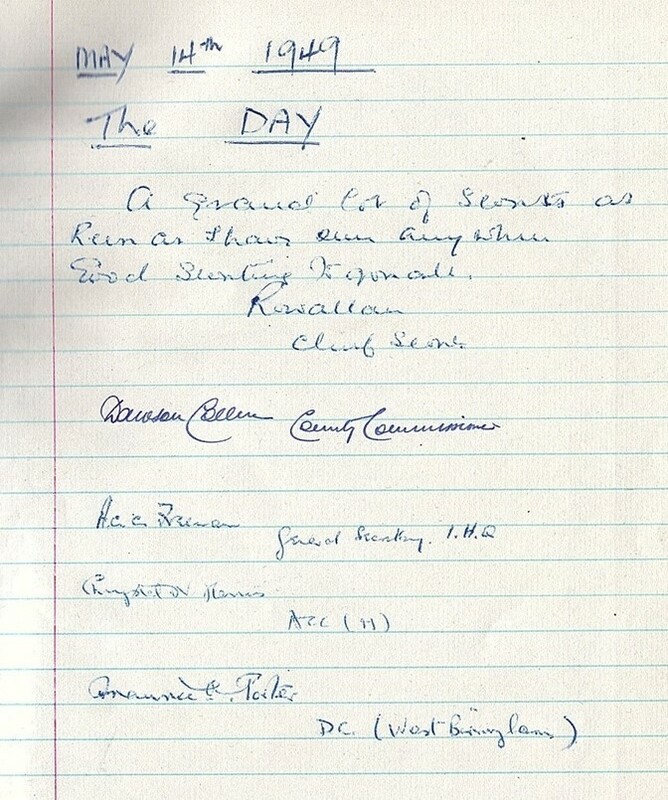 The day was set for the 14th May 1949. The venue would be Carlson House. During these early months details of the 152nd's progress was recorded in an unidentified local publication. 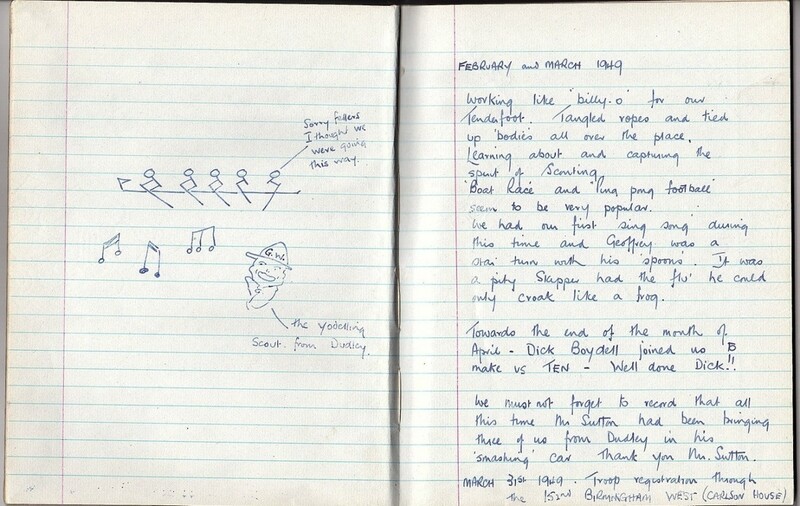 There are three clippings in the 'Log Book' that add some interesting information to the story. 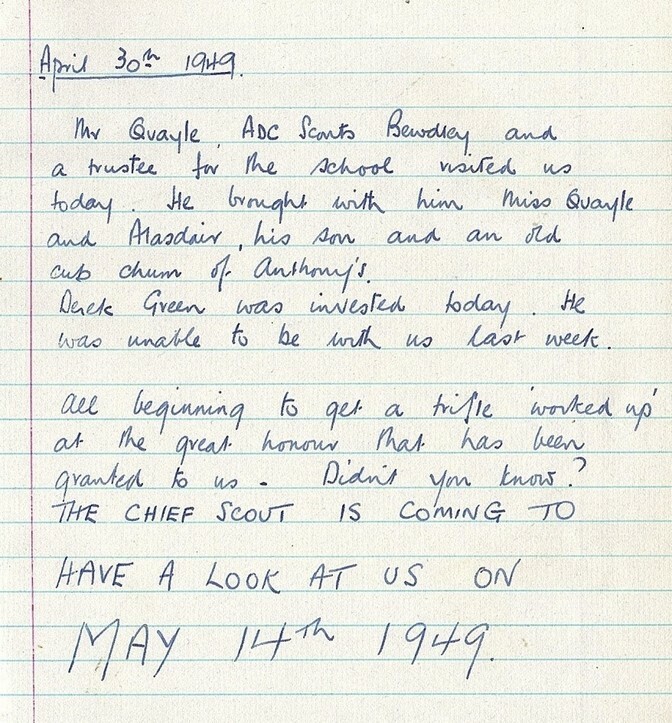 The first includes news of dignitaries from The Scouts attending the first Investiture and ends with news of the Chief Scout's intended visit which also appears in the pages of the 'Log Book' itself. 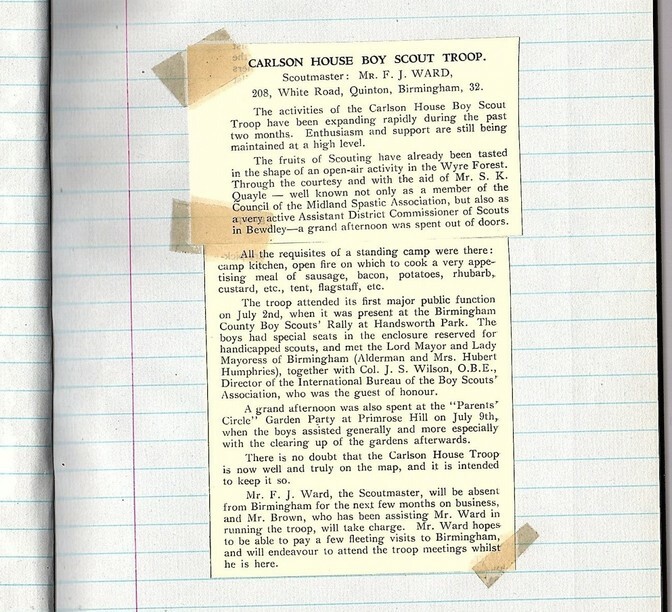 The excitement of the Carlson House Boy Scout Troop is echoed in the 'Log Book' entry for 30th April 1949 which also includes news of a visit by the founder and trustee Stephen Quayle who was accompanied by his son, Alasdair, who had cerebral palsy himself. One of the houses at Carlson Park is named in his memory. Mr Quayle, Mr Cadbury and Miss Woodall, the Headmistress of Carlson House School, were all present to greet the Chief Scout. 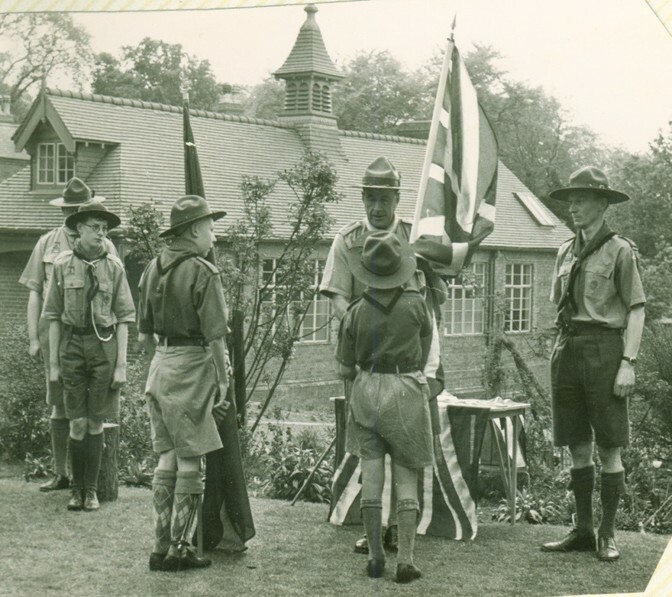 Not surprisingly the arrival of their leader led to an impromptu gathering of Guides and Scouts outside the school in Victoria Road. Lord Rowallan watched the boys at work and presented them with their colours. 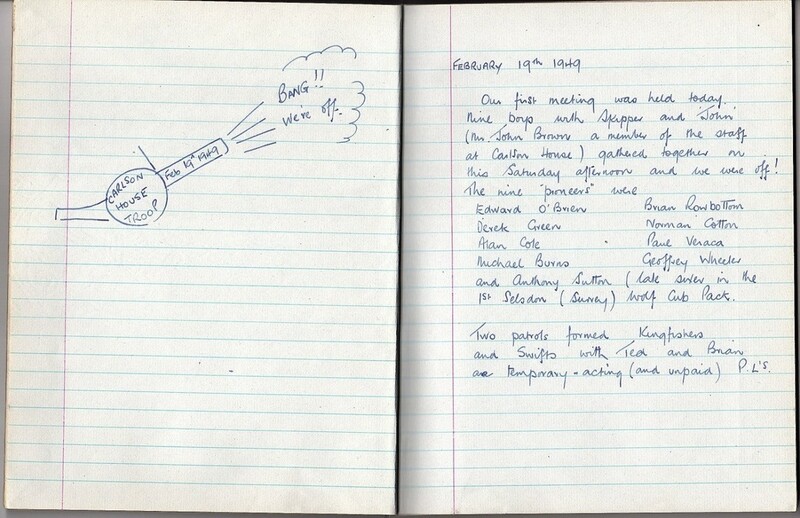 He also signed a page in the 'Log Book'. 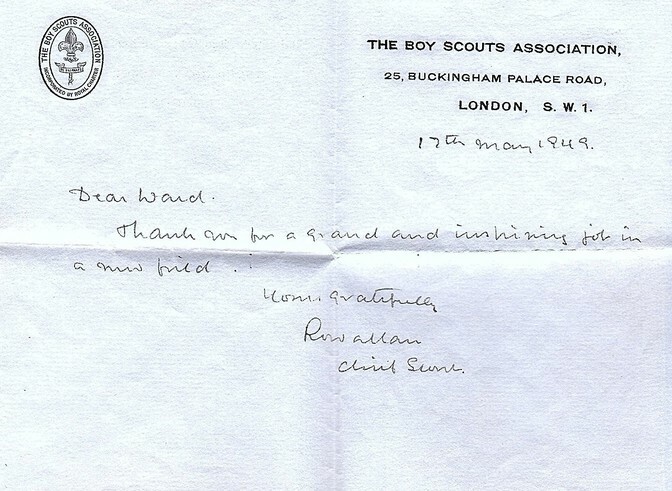 Lord Rowallan was obviously impressed with what he saw and later sent an appreciative note to Fred Ward to commend him on his "inspiring work in a new field". 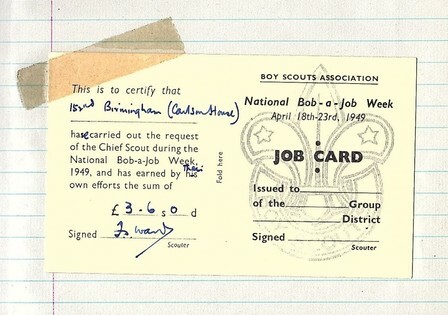 Even with his vast experience, the Chief Scout thought the 152nd Birmingham Scouts were a Troop who were breaking new ground. It also says that the Scoutmaster, Mr F.J. Ward will be absent for a while on business. In his place Mr Brown would take temporary charge. John Brown was mentioned at the very beginning of the 'Log Book'. He was at the first meeting and he worked as a porter for Carlson House School. Later he married the Headmistress, Miss Woodall. 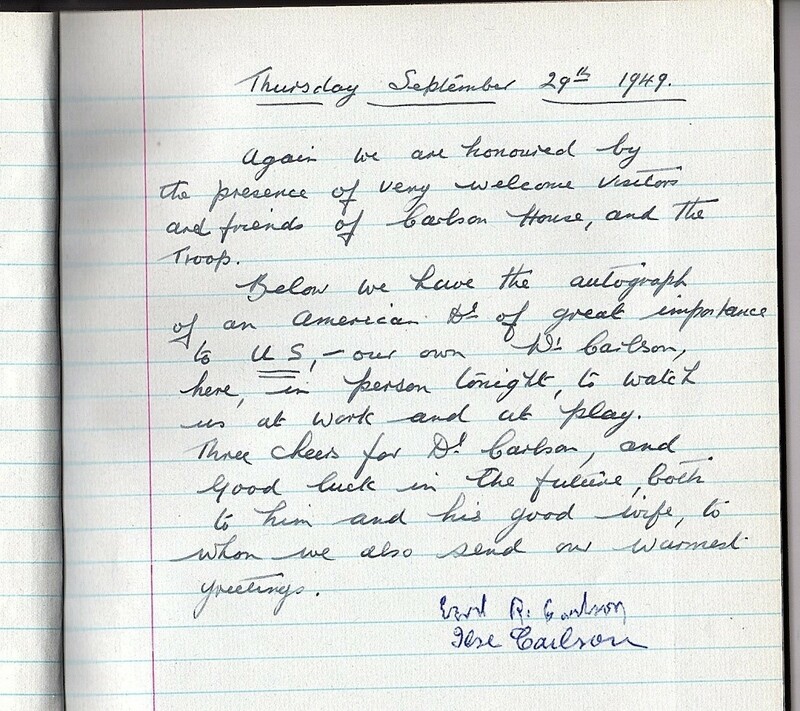 In September it may have been Mr Brown who wrote an entry in the 'Log Book' describing a visit by a very special guest indeed, none other than Dr Earl Carlson, the man who had given his name to Carlson House. His pioneering work with Cerebral Palsy had inspired Stephen Quayle and Paul Cadbury (among others) and contributed significantly to the founding of Cerebral Palsy Midlands and the school that bore his name. Both Dr Carlson and his wife signed the book. The page above is dated Thursday 29th September 1949. There is only one more entry after that and it was written by Fred Ward in January 1950. By then he was working full time in Dublin where he would stay for the next fifteen years. He and his wife were later involved in the foundation of Cerebral Palsy Ireland and my grandmother was the Press Secretary there. What happened to the 152nd Birmingham is at present still a mystery but hopefully the publication of the 'Log Book' will result in more information coming to hand. 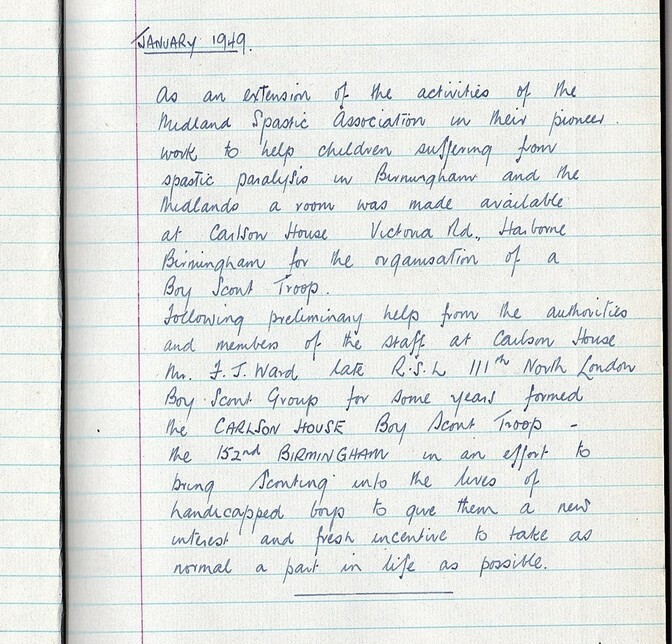 It is stated in the recent history of Cerebral Palsy Midlands that Mr Barrett arrived as 'Scout Leader' in 1952 but that same year the Scout Hut was converted into the Welfare Department. Was the troop still meeting regularly after that? 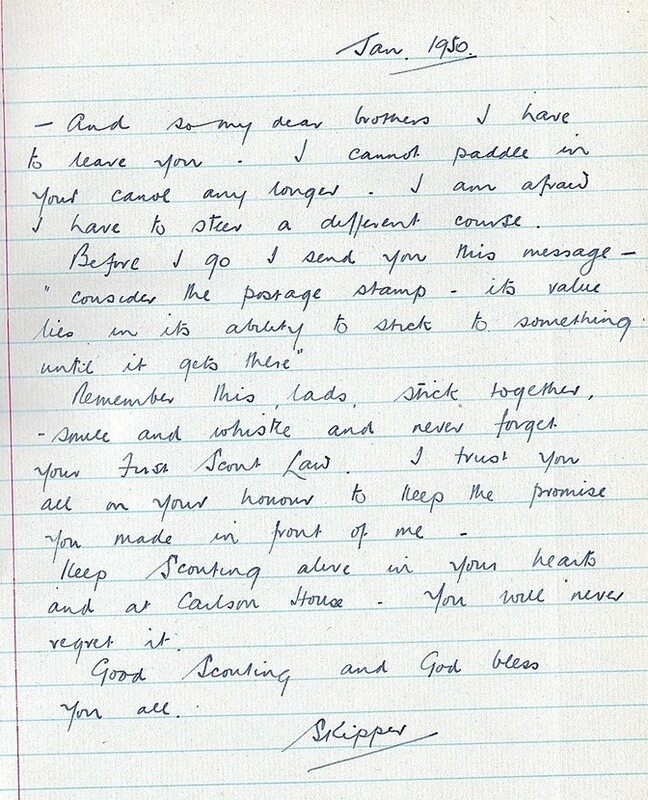 Whatever the answer may be, the sentiments expressed in his farewell to the boys make it very clear that Fred Ward intended the 'Log Book' to be returned to Carlson House. For some reason it never made that journey. Fred Ward was born the week The Great War started in August 1914. He lived in Highbury, North London. Dorothy May Heydon was born in 1908 and also lived in North London. They met through the Boy Scouts Movement where both were active during the 1930's. 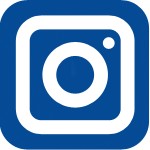 There is a photo collection of various camps May attended as a supervisor during that decade. They married in 1936 and had two daughters; my mother, Pamela, and then Heather who was born in 1942. Heather was to have cerebral palsy throughout her life and needed constant care. 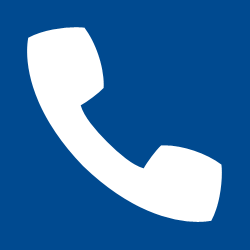 In 1937 the Wards had moved to Birmingham where Fred joined The Mercantile Credit Company. He was to work with them for the remainder of his career, thirty-eight years in total. Fred served in the RAF during World War Two and returned to his job in Birmingham afterwards. I don't know how much my grandparents knew of the founding of Cerebral Palsy Midlands or of the beginnings of Carlson House School but they must have had some prior involvement before the Scout Troop began at Carlson House early in 1949. The timing wasn't good for my grandfather. In February that year he went to The Mercantile Credit Company of Ireland on loan. By July he was being offered a permanent post there by Victor Adey, an old friend who had worked with Fred in Birmingham. 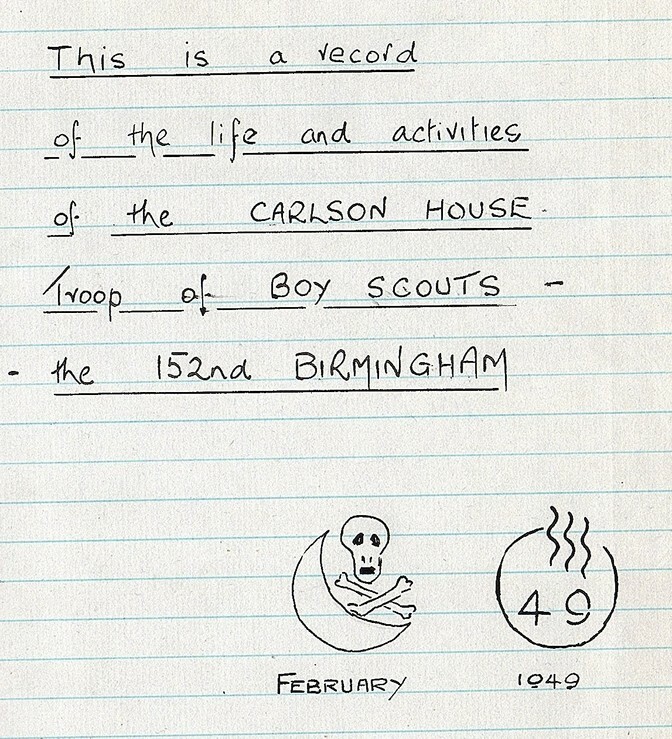 It is clear that he stayed involved with the Carlson House Scouts and that he kept the 'Log Book' with the intention of giving it to the boys. He was at the key events throughout 1949 and maybe into 1950. The last page speaks for itself. Why the diary was never sent we can only guess at. As it stands this diary is all we have of their history. Sending it back to where it all happened seventy years on might just preserve knowledge of the first Cerebral Palsy Scout Troop in England or even the wider World! Fred and May Ward lived in Dublin for sixteen years after leaving Birmingham and my mother met my father in Ireland. 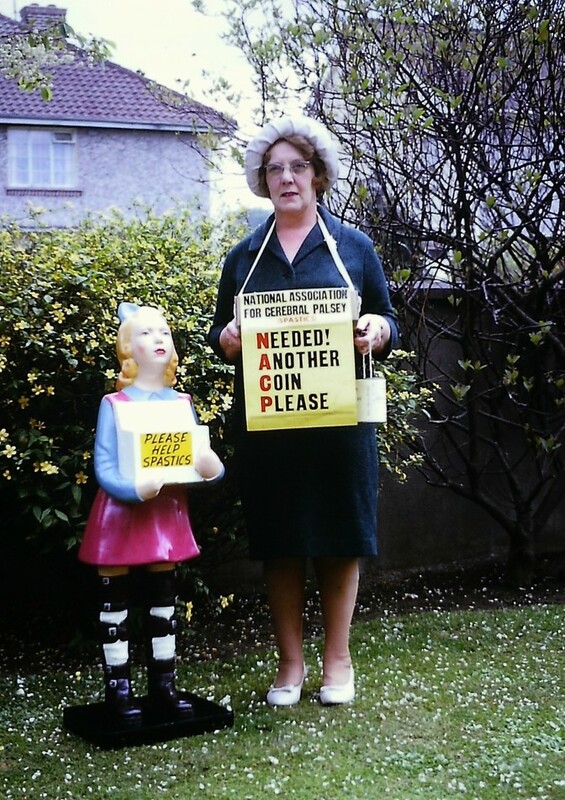 Because of Heather they became involved with the founding of Cerebral Palsy Ireland and regularly held events or funding days for them. May was their Press Officer. Through her work there she met the painter and author Christy Brown whose autobiography, 'My Left Foot' was named after the only limb he could control to paint or write with. We have a copy of the first addition of his book signed and dedicated to the Wards by Christy. Daniel Day Lewis won an Oscar for playing him in the film! 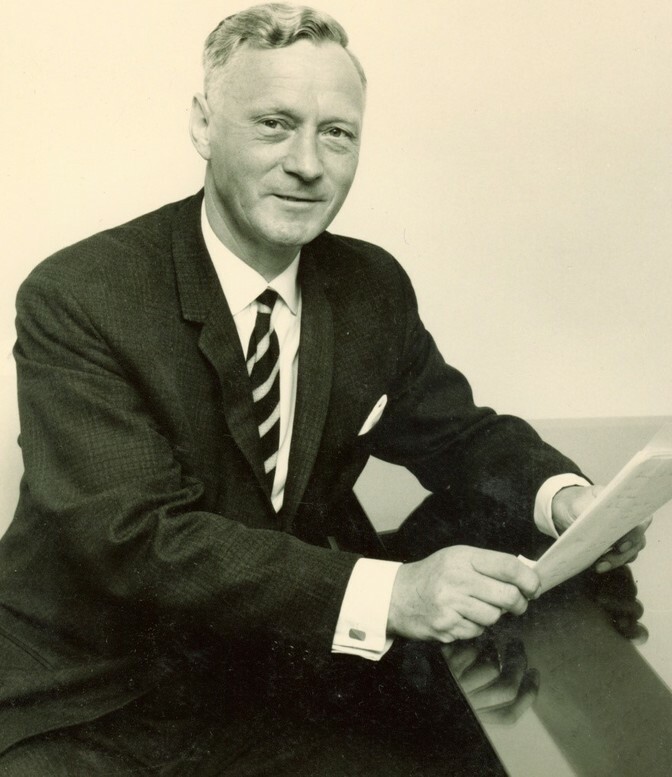 Fred Ward went on to be Managing Director of the Mercantile Credit Company of Ireland for seven years before moving to London in 1965 to rejoin his old friend on the board of the main company where Mr Adey had recently been given the top job. They both remained there until 1975. Heather lived at home until she was over thirty and then needed constant care. The family had moved to Colchester in 1965 and Fred commuted to Holborn for ten years before retiring in 1975 when Mercantile was bought out by Barclays. He died in 1981. Dorothy May Ward lived on with our family and passed away in 2001. 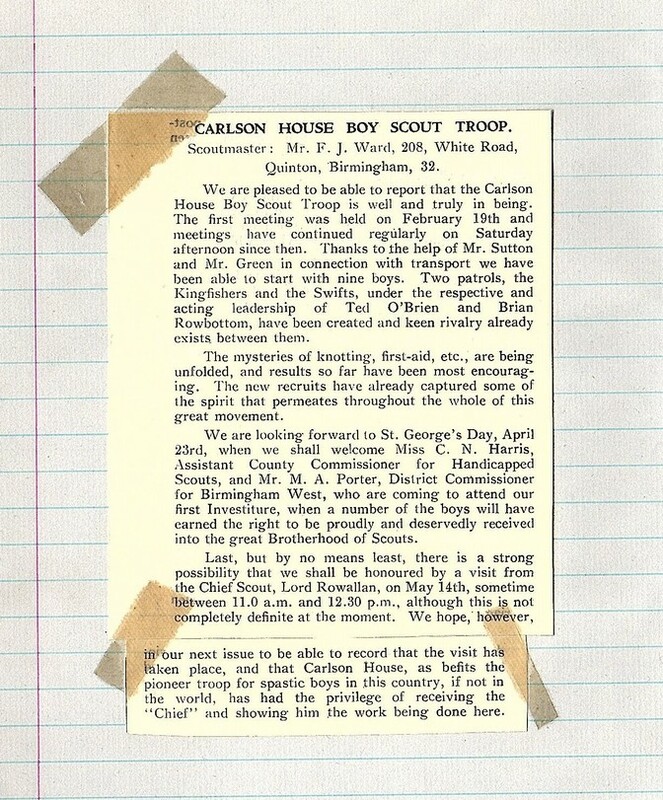 The more I know about my grandparents the more certain I am that they would both have been thrilled and delighted that their involvement with The Scouts and with Carlson House School has resulted in the rediscovery of a special glimpse into scouting history. 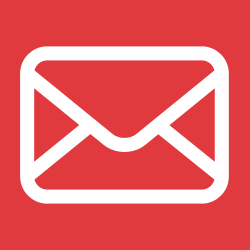 This information was provided by Aidan Crawte whose grandad was Fred Ward who founded the Carlson House Scouts group here when Cerebral Palsy Midlands was MSA back in 1949. A huge thank you for this rich history.